So often, we like to think we’re so different, so right, so unique, so blessed. We look across a border, a street, a barbed fence, and we feel secure in our own supremacy. Yet, don’t we all stare up and wonder upon the same sky that is impossible to fence, to cordon, to block off and call our own? This blog is about exploring the unexplainable, about asking questions that often raise still more questions and that can just maybe on occasion blow your mind. With that in mind, I stumbled across this footage on youtube of a UFO taken above the Temple Mount in Jerusalem this February by at least three photographic witnesses. You see, I have a love/hate relationship with online UFO videos and there’s been a huge influx of them this year. I love to use my technical knowledge of CGI and video to debunk them, and yet I’m always disappointed whenever I can. Yet, every now and then… I can’t. Some of the best footage was from before digital photography existed. It’s harder to fake a film negative. I’ve worked with various computer graphics artists professionally and done motion tracking and animation and so know a lot of the cheats. However, it’s hard to create shadows and to light buildings and streets the way it’s done in the below video as it’s shot from high angle, at least not without a pretty hefty amount of time or budget. The multiple camera angles, the cheapness and jerkiness of the camera phones, and the multiple witnesses involved, including an automated camera from an Israeli weather channel that happened to catch this incident, as well as the play of light and shadow on streets and the face of the dome, which changes as the object moves, make for a convincing argument that this is indeed an “unidentified flying object”. Beyond the technical merits of the footage, the location of where this was shot cannot be overstated. Wars waged by the righteous have been fought over this place for two thousand years. It is one of the most sacred sites in Islam, Judaism and Christianity alike. It is the epitome of both “We Are All One” as well as “This Land is My Land, This Land Ain’t Your Land, now get the hell off!” There is a reason the Palestinian/Israeli conflict has been obsessed over by every American president since 1947. This is the place where world peace, or world destruction could easily be born. Where better would the point be made that we are all so much more similar than apart? What better place than the focal point of Abraham, of Mohammed, of Jesus, where great thoughts and ideals about the best of humanity have been born. It is the place, after all, that Mohammed was said to be swept up by a bright light and carried up to heaven. If so, maybe it looked something like the image taken just before 1 a.m. earlier this year on that very spot. Wouldn’t it be obvious that this historic site may be on top of E.T.’s list to snap a few polaroids of when they happened to be in town? It’s easy to dismiss… until it’s not. Imagine the possibilities if, just maybe if… There is so much potential in that “if”. There is so much remembrance of how we all started this journey together and that we all get swept up in the same direction despite the make, model or year of the particular vehicle we choose to get there in. Imagine the best of what that sight, and the below “sighting” can represent. By holding onto that, anything becomes possible from there. The first video below shows some teens out for a romp at first, towards the end, they stop to look out at Jerusalem below and what they see… just has to be seen. Skip to about 4 min. 28 sec. for the good part. I like this angle, as it’s from a cheap camera phone and the waviness of the wide lens would make it even harder to fake. The motion tracking on this would be beyond anyone I know’s pay grade. Here are three different points of view that somebody synched of the same sighting. If you can sift through this, below is the weather camera footage of the event from an Israeli weather channel. The channel takes a still image of the sky every ten minutes to do a time lapse photography. 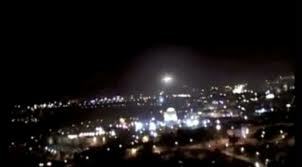 At the time in question, almost 1 a.m., a light appears above the dome on the mount that is apparent. Can all of this be faked? Sure. Anything is possible. I know of at least two other angles I found on the web that claim to be of this incident and that are absolutely fake, which someone put together using imagery shot off a t.v. screen in order no doubt to try and reel in some coattail youtube hits. However, when you combine this with so many other unexplainable events people have reported, you have to wonder. All it takes is just one of these incidents not to be fake to completely upset everything we know about our world. That said, as always, I say, keep your mind open and make up your own mind as to what seems true to you. It’s hard and yet an important thing in life to remain objective. There’s a lot of information on this subject of UFO’s out there, of whether we’ve been visited by UFO’s or not. In recent years the former governor of Arizona, Fife Simington, has come forth as a UFO witness even as he made fun of such witnesses while in office after a massive sighting in 1998 that became known as “the Phoenix lights“, Jimmy Carter signed an affidavit that he once, with 20 or so friends saw a UFO, the commanding officers of several NATO nuclear launch facilities held a press conference two years ago to tell the world that UFOs had shut down their silos on multiple occasions and hardly anyone batted an eye, much less paid attention, a former head of the FAA came forward a few years ago with actual radar tapes of UFOs he’d tracked on the job, a former Prime Minister of Canada has gone public with multiple incidents he knows of, an ex British Minister of Defense not only has come forward but helped Britain release 1000s of sighting reports to the public, retired military airmen of various countries have come forward as well as many many more credible, average citizens have all talked about their own experiences with things they have seen and yet cannot explain in the day or night sky. Soon for the t.v. version of Waking Universe, I’ll be interviewing one of those NATO nuke launch commanders that I happened upon recently at a signing of his book, “Faded Giant“. He is retired Air Force Captain Robert Salas and his story as well as his credentials are compelling. On his watch in 1967, as lights hovered over silos under his command, as reported by his topside guards, 26 nuclear missles magically powered down at once, despite being on separate, totally isolated and bomb proof circuits. He requested and received, years later, proof of the incident via Freedom of Information Act. He told me himself that when they tried to turn the missiles back on, no less than six times, the lights in the sky came back and the nukes powered back down, again and again, without any explanation to this day. Could somebody be trying to tell us something? Could somebody be stating the obvious that even the notion of actually using nukes to “win” a war is a perpetually losing, if not planet ending proposition? Pretty unbelievable stuff. Yet, here’s a brief teaser of Robert talking about the incident on Larry King. Coming soon in person to the Waking Universe.